How much sugar should you eat for optimal thyroid function and weight loss? How much sugar (carbs) should you eat for optimal weight loss and thyroid function? Does going over a certain amount of sugar raise blood sugar and cause insidious weight gain? I have family members with diabetes and hashimotos so playing around with sugar could be tricky. I've been questioning Mark's carbohydrate curve, which I have been using as a major guideline for the past few months. I haven't lost as much weight as I would like having gone low carb, (only 80-150 carbs at the start). I have lost 25 lbs and I have leaned out a lot. But can't break these last 15-25 lbs. Although I would like to lean out even more since I still have fairly large love handles and the spare tire . My energy levels were great at first, but got better after I added sugars back. I'm not sure what is a better sugar to have though. I don't want to damage my gut flora and cause a bunch of gas. from above link: "In our book, we recommend a slightly low-carb diet of 20-30% of calories. If we were re-writing the book now, we would probably be a bit less specific about what carb intake is best. Rather, we would say that a carb intake around 30-40% is neutral and fully meets the body’s actual glucose needs; and discuss the pros and cons of deviating from this neutral carb intake in either direction. For most people, I believe a slightly carb-restricted intake of 20-30% of calories is optimal. Most people are not currently seeking to have children or engaging in athletic competition"
What would be the max amount? So at least 150 grams of carbs a day? No I lost the 25 lbs 2 years ago. when I first started. Most of my digestive issues have gotten under control, yet I could never lose the last bit of weight. I recently add back in some carbs and extra calories. Yep, the "sweet spot" will vary depending on an individuals current situation, health, exercise etc. Their 'starting point' would be 20% calories from carbs (ie. 400 cals/100 grams on 2000 cals per day). Here's a quote from http://perfecthealthdiet.com/?page_id=8 "Daily carbohydrate intake should be 400-600 calories, primarily from starches (e.g., rice, potatoes, sweet potatoes, taro), fruits, and berries, except on therapeutic ketogenic diets (which should have ~200 carb calories)"
Another "rule" they have (which i kinda like) regards the minimum carbs+protein intake. They say this min number should be 600 calories (150g). So if you were on a 'therapeutic ketogenic diet' with say 50g carbs (200 cals), you need to make sure you are getting at least 100g of protein (400 cals). This is kinda represented by the gluconeogenesis part of the graph. A glucose deficit is made up by gluconeogenesis (manufacture of glucose from protein). Another "rule" they have (which i kinda like) regards the minimum carbs+protein intake. They say this min number should be 600 calories (150g). So if you were on a 'therapeutic ketogenic diet' with say 50g carbs (200 cals), you need to make sure you are getting at least 100g of protein (400 cals). 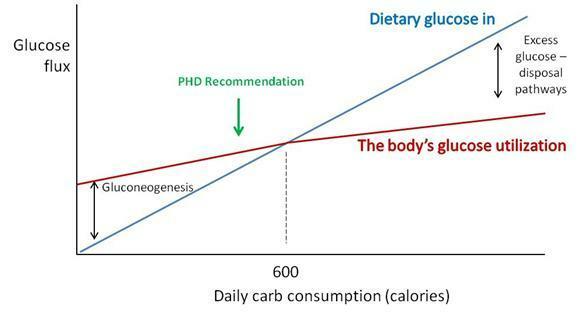 This is kinda represented by the low intakes a deficit is made up by gluconeogenesis part of the graph. A glucose deficit is made up by gluconeogenesis (manufacture of glucose from protein). Yep, the "sweet spot" will vary depending on an individuals current situation, health, exercise etc. Their 'starting point' would be 20% calories from carbs (ie. 400 cals, 150 grams on 2000 cals per day). Here's a quote from perfecthealthdiet.com/?page_id=8 "Daily carbohydrate intake should be 400-600 calories, primarily from starches (e.g., rice, potatoes, sweet potatoes, taro), fruits, and berries, except on therapeutic ketogenic diets (which should have ~200 carb calories)"
Yep, the "sweet spot" will vary depending on an individuals current situation, health, exercise etc. Their 'starting point' would be 20% calories from carbs (ie. 400 cals, 150 grams on 2000 cals per day). Here's a quote from http://perfecthealthdiet.com/?page_id=8 Daily carbohydrate intake should be 400-600 calories, primarily from starches (e.g., rice, potatoes, sweet potatoes, taro), fruits, and berries, except on therapeutic ketogenic diets (which should have ~200 carb calories). You lost 25lbs but are unhappy because you're struggling to lose more after adding sugars back in? So on that graph 600 calories = 150 grams.....and their recommendations come in a bit bellow that. Sounds pretty consistent. Yeah carbs. What's the best form too and why? What do you mean by sugar? Carbs? Mark's carb curve is a fine place to start and add or subtract from there based on how you feel, how active you are, and your goals. His upper level of 150g carbs is pretty consistent with moderate carb intake....so there is plenty of room to play around with it. Paleo carbs are primarily root veges, tubers, and fruits.